Words cannot begin to describe today! It was an absolutely wonderful event. For the first ever Washington County Zumbathon, I could not be happier. The morning started off with wonderful volunteers that arrived early to help where needed. The event wouldn't have been possible without Anita Binder. She was the savior that helped this event go off without a hitch. Without her this event wouldn't have possible (especially through everything that has happened with my grandfather). People were taking money at the door, stamping hands, selling t-shirts & raffle tickets and showing off wonderful door prizes. Without them today wouldn't have been possible. Around 10:00 am I had the greatest pleasure possible and honestly it goes down as a moment that I will treasure for a lifetime. We were able to have Jessica, the Miracle Child from Washington D.C. attend our event. She has been treated at Children's Hospital and has directly benefited from fundraisers like today! She was truly a breath of fresh air as she walked through the door. She immediately greeted me with a hug. Her ever supportive Mother, Sheila, her Aunt and brother were all in attendance. The hugs I received from them made this day all seem real. Jessica was full of energy. She just received her red belt in Kong Fu and was dancing all around the event today. Having Spinal Bifida has not set her back at all. When I took her mother and her onto the stage, I was so blessed to introduce them to everyone. Delegate Chris Shank and Senator Don Munson were also in attendance for this fabulous day and I thank them for their continued support. I presented both her mother and Jessica with Zumbathon t-shirts and flowers! Then I had the greatest pleasure of all. I presented Jessica with an old crown of mine. I crowned her using the crown that I had when I was Miss Teen Washington County 2005. I truly don't think that even touches on what her visit meant to myself and everyone at the event. We were very lucky to have Shelia talk about Jessica's illness and her connection with Children's Miracle Network. Jessica even said a few words. I can tell you one thing that 10 year old's energy put everyone's to shame at the event. As I placed the crown on Jessica's head today, I thought to myself: this is what it is all about. It isn't about how many shirts we sold, how many vendors came or even if we were to raise thousands of dollars...It was all about Jessica and thousands of children like her all over the country. I know today the money we raised will be used at over 170 Children's Miracle Network hospitals in the United States. I am so pleased to have met such a deserving young girl and her fabulous family. She is truly an inspiration to all! I hope to keep in touch with her as she grows and matures--that little girl is going places! We do not have a final count from today but regardless I know that I put a smile on one little girl's face and to me that means much more. I know it was a successful event and I will be happy with however much money is sent to Children's Miracle Network. With preparations for Miss MD now in full swing I know what I will keep close to my heart that entire week. I will remember Jessica and her loving family. I will remember having the honor to meet her. I will remember passing along a special piece of me to her. I will remember the smile on that little girl's face as she received the crown and danced her little heart away during the Zumbathon. Whether I am lucky enough to win Miss Maryland or not, today has meant the world to me and I am so lucky to be Miss Washington County 2009! My Grandfather is going to be discharged tomorrow from the hospital. We are very excited about this. He is definitely not back up to 100%, but with therapy he is on his way. He has been in for over 25 days now! It is truly hard to believe. Miss Maryland preparations are going very well. The dance is complete & being perfected as we speak. Wardrobe has been sent to the seamstress. I am anxiously awaiting the arrival of my swimsuit from Winnwear-the official swimsuit sponsor for Miss Maryland this year! We are also waiting to hear that our opening number dresses have come in. I think it is a matter of putting all of the final pieces together! I am very excited to once again be representing Washington County. With this being my hometown, it is that much more special to me!! I will try to keep you updated as things come along! Don't forget to plan your Saturday around ZUMBATHON!! A Month from now Miss MD will be over!! It's hard to believe that a month from now and Miss MD week will be over! My Miss MD preparations are in full swing. Yesterday was filled with a visit to the seamstress and working on my dance. I am getting really excited. I have described it this way to a few people: it's too soon, but not soon enough! There is still a lot that needs to be done, but on the other hand I wish I was moving into the hotel tomorrow. Today's schedule consists of the gym, getting my hair trimmed and working on my dance later this evening. Of course, mixed in with everything are all my preparations for "Miss Washington County Zumbathon". I am more than excited about this event. I feel that it is going to be very successful with the help from everyone in the community. That day is not about me or the instructors, it is all about Children's Miracle Network! There are a lot of surprises in store, so I encourage everyone to come out. I am not going to give anything away on here! :-) Remember a $5 donation to have a marathon event of Zumba to benefit Children's Miracle Network--I truly don't know what gets better than that! An update for those wondering: my Grandfather is doing much better! He is currently doing rehabilitation at Washington County Hospital. He is really enjoying the people there and the care he is receiving! He is truly a cat with 9 lives and we are so lucky that he was with the family when he had his stroke. It was a sign from God that he was meant to "be okay" in the long run! Thank you to everyone for your prayers and continued support of myself and my family! Remember, Audi (my little sister) is Miss Washington County's Outstanding Teen! Our family is so excited to have "real-life" sisters and "pageant" sisters all in one! Today was a busy day getting things lined up for "Miss Washington County Zumbathon". I cannot believe it is 11 days away. For those of you who don't konw I am holding a marathon event of Zumba on Saturday, June 6th at Hager Hall (Clarion Hotel). It is from 10 am-2 pm. There will be different instructors from local fitness clubs taking turns leading the event. There will be a $5 donation at the door that will benefit Children's Miracle Network. I am sooo excited because not only are we raising money for CMN, but we are promoting my platform of Physical Fitness. There will be a fruit and smoothie bar at the event, along with vendors and door prizes. I hope everyone can come out for this great event!! We are still looking for sponsors so anyone that is interested, we would greatly appreciate any contribution. Happy Memorial Day! Thank you to all that have served and all that are still serving!!! Yesterday wasn't a very eventful "pageant" day. I went to the baby shower for my future niece. It was a wonderful day with family and friends. I am very much looking forward to the birth of my new niece in about a month! Last evening I was able to go to a Hagerstown Suns game. What is a better way to celebrate Memorial Day Weekend, then enjoying a hometown baseball game!? My nephew, Jacob, was standing by the fence getting "high-fives" from the players as they walked by. As number 10 approached, Jacob reached his hand out for the "high-five" and in return the player handed him his batting gloves and bat! Needless to say he was ecstatic! I hope everyone enjoys their day with family and friends! Today was the Sharpsburg Memorial Day Parade. I was blessed to have a 2009 Ford Mustang to ride in, lent to me by Hagerstown Ford. It was about 90 degrees today, so needless to say it was quite warm sitting on the back of the car. I was able to have one of my princesses, Sara Farmer, ride with me today. 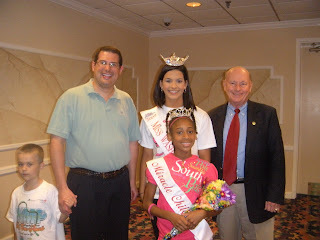 I have been able to mentor her since my first year in the Miss pageant, which was in 2007. I have not only developed a great relationship with her, but with her entire family! A small update on my life currently: I just finished my sophomore year at Shenandoah University. The nursing program is going very well and I love being able to work in the clinical setting! At this exact moment I am watching the Shenandoah University Baseball team play in the Division III World Series. I was not able to fly out to Appleton, Wisconsin to watch them play so I am left with my laptop & the online broadcast. Hey, it's better than nothing! I was able to travel to Salisbury, MD last week to see them play in the Regional Tournament. On another note, my Grandfather has been hospitalized for the last 14 days. The day after I came home from SU, he had a stroke. We have to look at it positively, that he was with my family when it happened. He was in the right place at the right time. He began rehab today and we are very excited about this! He is starting to improve. Please keep him & my family in your prayers! 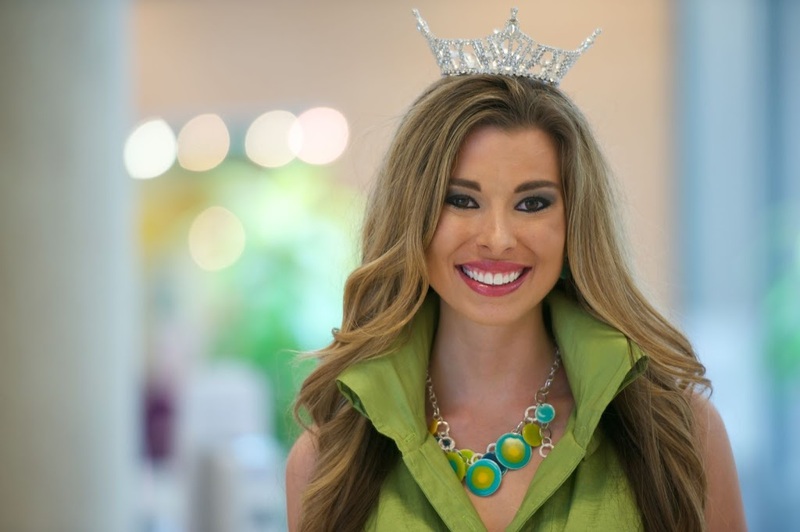 I am starting to get very excited about Miss Maryland. The gym visits have begun and will stay up through Miss MD week! Wardrobe selections are going well. I look forward to keep you guys updated throughout the next 29 days! Click Here for many photos and video clips of the parade!